A jewel of a destination, Srinagar, is one of the most awe-inspiring holiday destinations in India. The indulgent houseboats, historic Mughal gardens, distinctive Kashmiri wooden mosques and a mild summer combine to make Srinagar, the paradise of east. In this blog we shall discuss why Srinagar should be the next destination on your to – travel list. We bring to you the 10 most convincing reasons to visit Srinagar next time you plan to travel. Manasbal Lake: The Manasbal Lake is one of the famous lakes of Srinagar. Located at a distance of 30 km north of Srinagar, the lake is one of the supreme gem of all the lakes. During the months of July & August the lake side is decorated with beautiful lotus flowers. Known as the bird watcher’s paradise, this lake is the best place to experience peace and tranquility. Shankaracharya Temple: Dedicated to Lord Shiva, this temple is known for its architectural marvel. A winding road leads to the top of the hill from where a circular series of steps lead to the temple. The best time to visit this one, is from September to October. Shikara Rides on the famous Dal Lake: Another reason that Srinagar should be on your travel cards is shikara rides on Dal Lake. A ride on the vibrantly colored shikaras in the gleaming waters of Dal Lake is all you want, especially when you want to get away from the busy city life. Hazratbal Dargah: Made from the white marble, Hazratbal Dargah is famous for housing the hair of Prophet Muhammad. Located on the western shore of the Dal Lake, its pristine white marble shimmers on the waters of the lake. Hazratbal Dargah is famous as the only domed mosque in Srinagar and it is said that its construction took good 11 years. Food: Somebody has rightly said, “to understand a culture, one must taste it” and this is exactly the reason why food is there on our list. The delectable cuisines of Srinagar are a mixture of aromatic spices and condiments to tickle your taste buds. From the mouthwatering non – vegetarian foodstuffs to the flavorsome vegetarian dishes, the entire cuisine is prepared painstakingly. The famous dishes include Haakh, Goshtaba, Kawah and many more. Famous Mughal Gardens: With terraced lawns, cascading fountains and bright flowerbeds, the three Mughal gardens of Chesmashahi, Nishat and Shalimar were built for the Mughal emperors. These three share common features such as a rectilinear layouts, canals, fountains, pools of running water and a number of different flowers, trees and aromatic grasses. The Mughal gardens of Srinagar are heavily influenced by the Persian concept of gardens. Shopping In Srinagar: Srinagar boasts of a plethora of products that belong to Srinagar exclusively, shopping is also a different kind of experience here. From the soft pashmina shawls to the colorfully painted papier mache products, to saffron and a variety of ornamental jewelry, one can get them all only in Srinagar. Adventure in Srinagar: Srinagar offers a variety of activities for adventure, such as one could go for paragliding in the beautiful green valleys and enjoy the view of the mountains. Apart from this, one can also go for golfing in the Royal Springs Golf Course. Breathtaking beauty of Srinagar: Srinagar, will charm the socks off you, in every way. Being an epitome of beauty and tranquility, Srinagar, is a treat for everyone’s eyes. From the beautiful landscapes, to the snow covered mountains, to the breathtaking gardens full of colorful flowers, Srinagar has it all. It is truly a paradise on earth. 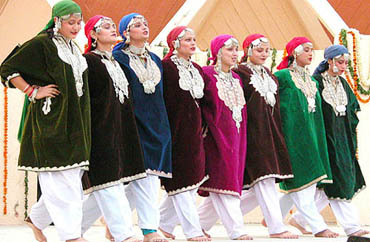 Culture & People: The people of Srinagar are quite affectionate when it comes to attending their guests. Just like the people, the culture of Srinagar is also quite lively, the Kashmiri’s are quite fond of Sufiana music and dance forms like Bhand Pather which highlights the social evils in the form of a satire. With so much to offer Srinagar definitely top’s up the chart of travel destinations. If you plan to travel just after reading our blog, don’t forget to take your heavy woolens along. Wish you a Happy Journey well in advance.